Top Supreme Court advocate Prashant Bhushan has sharply criticized the Government of India (GoI) for sitting on 170 recommendations by the Supreme Court collegium for appointments to High Courts over last two months, saying this has come about after the Supreme Court struck down the GoI’s wanting to have a National Judicial Appointments Commission. Pointing towards the recent “anguish” by India’s chief justice TS Thakur over lack of “greater government participation”, Bhushan, who is convener of the Campaign for Judicial Accountability and Reforms (CJAR) said, the Chief Justice’s speech revealed that the “efficient functioning of the judiciary rested on steady and regular appointments, which were being stalled by the government’s inaction in clearing appointments. The chief justice, while addressing recent joint conference of Chief Ministers and Chief Justices of High Courts and the Supreme Court two days ago, had said though the Law Commission had, in 1987, recommended a five-fold increase in the total strength of judges, to roughly 50 judges per million population, the strength of the judges has hardly been increased since then. This, according to Thakur, had led to a situation where three crore cases are pending in lower courts, several lakh in High Courts and thousands in the Supreme Court. Even then the Central and State governments have been passing the buck. 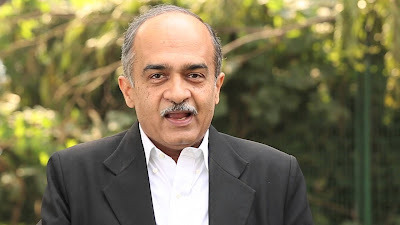 “With the government and judiciary at loggerheads, and a completely opaque system of appointments to the higher judiciary, there is little scope for improvement in the present system which is shrouded in secrecy”, Bhushan said in a statement on behalf of the CJAR. Criticizing the GoI for running “an opaque, secretive and arbitrary system of appointment and transfers”, which is giving rise to “nepotistic considerations”, Bhushan said, “With no criterion laid down for selecting judges and no methodical or objective evaluation of proposed appointees on any criteria, the system will continue to suffer from inefficiencies”, he added.